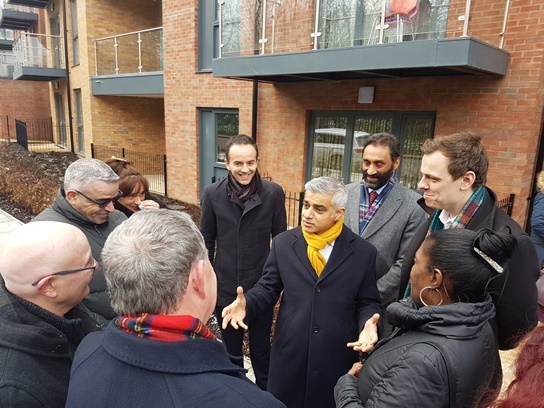 Published Wednesday 23 January 2019 Mayor of London Sadiq Khan and Deputy Mayor James Murray have paid a visit to new council homes at Copley Hanwell W7. On the visit, which took place on Wednesday 23 January, they were shown 31 flats in Darlington Court by Councillor Peter Mason, cabinet member for housing planning and transformation. These flats are the first new council homes completed in Ealing since the Mayor announced last October that he had awarded the borough a grant of nearly £100 million. The funding will contribute towards Ealing’s plans to build 1,138 genuinely affordable new homes – the most ambitious council homebuilding programme in London. Those 1,138 properties will account for a sizeable part of the council’s overall aim of creating 2,500 new genuinely affordable homes by March 2022. The remainder will be delivered through private developments in the borough. All of the homes will be available as social rent, London Living Rent or London Affordable Rent tenures or as other affordable options like shared ownership. Phase six of development at Copley Hanwell W7 will get under way in summer 2019. Copley Central, as it will be known, will include 201 new homes with a mix of tenures and is likely to be finished by early 2022. James Murray then visited the High Lane estate in Hanwell, where he met local residents and found out more about the ballot recently held there. The ballot, in which 90% of eligible residents voted in favour of the council’s plans to regenerate the estate, was the first that the council has run since it committed last year to consulting local people before the regeneration of their estates goes ahead. Councillor Julian Bell is the leader of Ealing Council and lead member for regeneration. He said: "It’s great that the Mayor saw the hard work that is taking place in Ealing to provide genuinely affordable homes that are also built to the highest standards. These award-winning homes set the bar for what we are trying to achieve – affordable, well-designed modern homes where people would want to live. Councillor Peter Mason is Ealing Council’s lead member for housing, planning and transformation. He said: “Ealing’s council homebuilding plans are the biggest in London, reflecting the growing demand for safe, fit for purpose homes that are within our residents’ means. The work we’re doing will ensure that more people will be able to access the homes they need to thrive, but it’s vital that we work in partnership with our residents, rather than dictating to them.